Good morning everyone! Happy Friday! Sorry I’ve been MIA this last week and a half. I have been so busy trying to get my projects for my Artisan Design Team Contest entry done and with the Make and Take last week. I just got the supplies from the Make and Take put away last night! Sorry, no peeking. You don’t get to see the projects I made until after I get back from Convention. 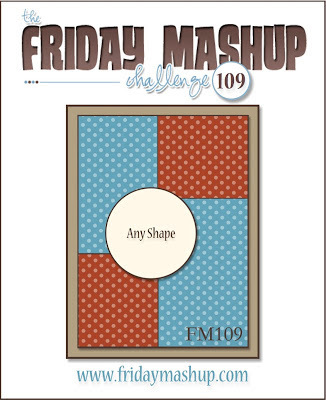 Anyway… on to the Friday Mashup card from last weeks challenge. I’ll post the challenge for this week this afternoon. Create a "set of cards". I guess I missed the mash up part huh? I didn’t even realize that until yesterday. Oops! Oh well. I started off with a piece of Strawberry Slush card stock cut at 5-1/2” x 8-1/2” and scored at 4-1/4”. I had these scraps sitting in my bin from the fabulous new Quatrefancy DSP. I used most of one package to make some 3D swaps for convention. So I cut down the pieces to 2” x 3” and 2” x 2-1/2”. I adhered the DSP onto the card front. 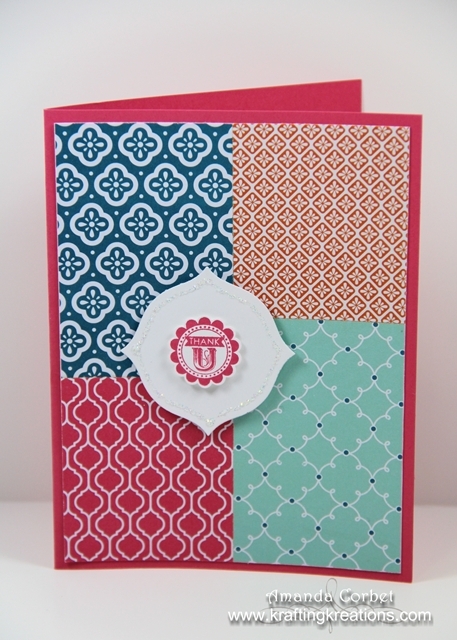 I stamped the greeting from A Round Array ( I love this set!) in Strawberry Slush onto a scrap of Whisper White card stock, then punched it out with my 7/8” Scalloped Circle Punch. I already had the Whisper White label shape that was cut with the Apothecary Accents Framelits. So I just used a Stampin’ Dimensional to adhere the scalloped circle onto the label, and another to adhere the label onto the card. Just to add a little bit of sparkle, because a card always has to have at least a little bit of sparkle, I added some Dazzling Details around the Whisper White label shape. Bright, fun, and cheerful! Did you get a chance to play along with last week’s Friday Mashup challenge? Take a look at the Rock Starand Glammettes that were chosen!